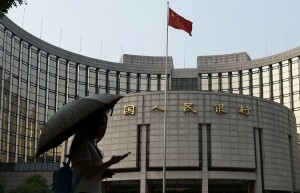 China’s central bank on Tuesday cut its benchmark interest rate and freed banks to lend more, the latest signs of the government’s growing distress over slumping stocks and slowing economic growth. The central bank’s action followed a global stock market rout in which China led the declines. The main Shanghai share index plunged another 7.6 percent on Tuesday, to its lowest level this year. That brought its three-day decline to 22 percent, signaling that two months’ worth of attempts by the government to prop up stock prices had limited effects. On Tuesday, China’s prime minister, Li Keqiang, acknowledged that the country was feeling the effects of market turbulence, but insisted that the economy remained sound. China, he added, would be able to fulfill its economic goals for the year. Mr. Li also noted that there would be no continued depreciation of the renminbi currency after a sharp devaluation earlier this month. The currency “can maintain fundamental stability at a reasonable and balanced level,” he said. Even so, the tumult has prompted further action by the leadership.